These pie charts speak for themselves. 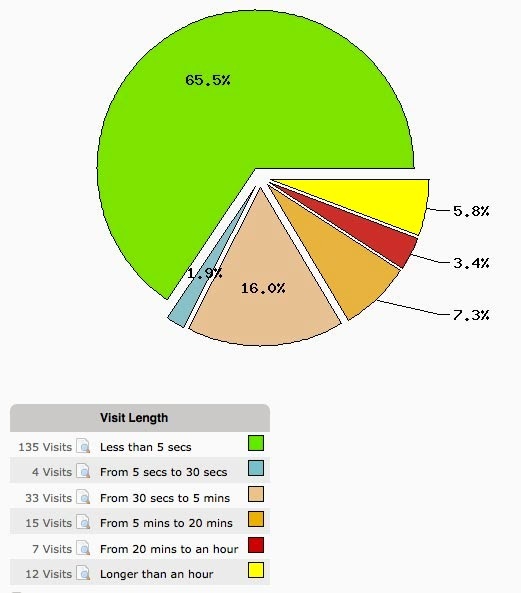 Only 15% of visitors return for a second visit. 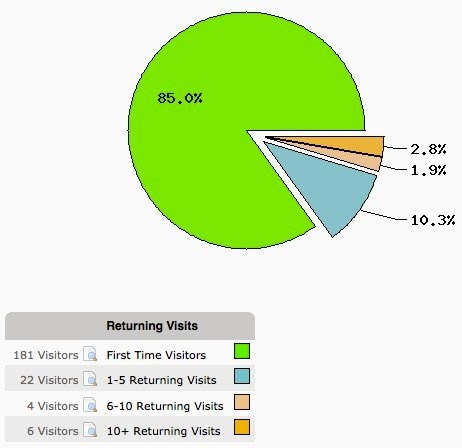 The reason I'm showing these stats is to say how disappointing it is that the vast majority of visitors never bother going beyond the main page (and only for less than 5 seconds). I've started this blog back in 2009 so there's tons of stuff beyond the main page including the permanent pages (listed on the left column). Ces statistiques parlent d'eux-mêmes. Seulement 15% des visiteurs sont de retour pour une deuxième visite. La raison que je montre ces stats c'est pour demontrer comment décevant que la grande majorité des visiteurs ne se donne pas la peine d'aller au-delà de la page principale (et seulement pour moins de 5 secondes). J'ai commencé ce blog en 2009 donc il y a des tonnes de choses à voir au-delà de la page d'accueil, y compris les pages permanents (figurant sur la colonne de gauche). Just so you know, I'm a regular of your blog and like many others (I suppose), I read your blog content through a reader (used to be Google Reader, now Feedly). I suspect if many of your readers get their content through a reader (instead of directly off the website), this may skew the statistics significantly. Feedly probably spends only a fraction of a second pulling content from the website, which might explain the short duration. Feedly also then feeds the content to many readers, but probably only registers as a single user. You may want to look into that to properly interprets reader statistics. Same as Clement: I read your posts through Feedly... Continuez votre bon travail! I'm also a feedly user just like the first commenter. Came to say the exact same think as Clement. I read your blog through my Feedly and hardly ever visit the website. So I was wondering if this taken into account. Thanks Clement, guys for the info. Statcounter does show some hits coming from Feedly but yes if you view updates nested in Feedly it most likely doesn't count as a hit or won't show the amount of time spent at the site. My main issue though is that a lot visitors do end up here by accident, most of them looking for condo projects or just out of curiosity and those visitors hardly go beyond the first page. It's been like this since day one which is frustrating not just because of the amount of work I put in here (well sorta...) but it seems few Montrealers are curious with what's going on in the city. Most visitors or commentators or folks whom have emailed me directly are from outside of Montreal like Vancouver or Edmonton or even from outside of Canada like Texas, France, UK or even Germany. I find that strange. Anyways again thanks for the support and the input. Hey budy, Denis here. I use Feedly as well but I usually click the link to come to the page, so I do end up on the site most of the time. Anyway, don't let these stats dishearten you, I love your blog as always! I visit your blog regularly because as a resident of St-Henri I think you are doing an amazing job documenting the changes in the neighbourhood and in Montreal as well. I would suggest getting a Twitter account for your blog. I publish a weekly webcomic about Montreal and like to share links related to our city on my comic's Facebook and Twitter page. I shared your blog last Monday and it got retweeted a few times on Twitter :) I think Twitter is a great way to make your work known to locals and the media. La banque d'information et de photos accumulées sur ce blogue est très pertinente. J'utilise aussi Feedly, alors je suis un autre lecteur invisible. Again thanks everyone for the feedback and support.